As Hezbollah rockets continue to rain down on northern Israel, the Israeli air force launched a wave of bombing raids on the Lebanese capital's southern suburbs early Sunday, Hezbollah's Al-Manar TV and witnesses said. A total of some dozen loud explosions shook the capital, much of which was plunged in darkness after Israeli warplanes struck power stations and fuel depots feeding them. Hezbollah's TV aired footage it said showed the new strikes. The pictures showed two long columns of smoke rising from buildings into the night sky. The TV station said a bridge linking the al-Hazmiyah district to the road that leads to the airport, south of the capital, also was targeted. In Israel, the military confirmed that Israeli warplanes were bombing the Hezbollah headquarters in south Beirut. The extent of the damage caused to the suburbs could not be established because the area is deemed too dangerous for journalists to visit. Most of the raids target an area known as the "security square," where Hezbollah has its headquarters, reportedly destroyed in a Friday air strike, and where some of its leaders live. To the south, across the Israeli border, the biblical town of Tiberias was hit by Hezbollah rockets three times on Saturday. These were the first attacks on the city – 22 miles from Lebanon – since the 1973 Mideast war. CBS News correspondent Richard Roth reports the rockets delivered a deadly message from the guerilla group: Hezbollah can strike deep into Israel. Israel's third largest city, Haifa, is about the same distance from the Lebanon border, and Roth reports, Patriot missile batteries have been deployed to protect that city. 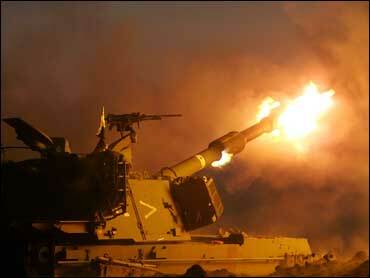 Such powerful weapons in the hands of Hezbollah have forced Israel to expand its original goal in attacking Lebanon. The Israelis are now not only trying to rescue their two captured soldiers, Roth reports. "At the end of this war Hezbollah will not be deployed on Israel's northern border," said Miri Eisen, a spokeswoman for the government. Lebanese Prime Minister Fuad Saniora pledged Saturday to extend his government's control over all of Lebanon, signaling he wants to end Hezbollah's autonomy in the south — a top Israeli demand.